Last November I wrote about the Rabah Ameur-Zaïmeche retrospective at the French Institute Alliance Française (FIAF) in New York that was among my most memorable film experiences that or any other year. Unknown to me before the series, I came away feeling that the French-Algerian Ameur-Zaïmeche ranked with the Dardenne brothers, Nuri Bilge Ceylan and Jafar Panahi. If those names mean something to you, you’ll know that is high praise. I also have high praise for whoever curated the films shown at the FIAF since they were and are a reminder that despite globalization and the heavy hand of Hollywood commercialism on film studios everywhere, France remains a cultural beacon. We are now blessed with a new series starting on Tuesday, May 2nd that should have enormous appeal for my readers in the New York area. Titled “Liberté, Égalité, Fantasy: French Politics on Film” and scheduled through May 30th and shown on Tuesdays at 4 & 7:30pm, it gathers together works that I have never seen except for the one at the top of the list. The Candidate, dir. Niels Arestrup, Tuesday, May 2 at 4 & 7:30pm. Introduced at 7:30pm by Arun Venogopal, WNYC reporter. Struggle for Life (La Loi de la jungle), dir. Antonin Peretjatko, Tuesday, May 9 at 4 & 7:30pm. Introduced at 7:30pm by Annie Bergen, WQXR host. Pater, dir. Alain Cavalier, Tuesday, May 16 at 4 & 7:30pm. Special Section, dir. Costa-Gavras, Tuesday, May 23 at 4 & 7:30pm. Gaz de France, dir. Benoît Forgeard, Tuesday, May 30 at 4 & 7:30pm. I plan to write about the films in the series each week, both for my own sake and for the cinephiles who rely on my reviews. 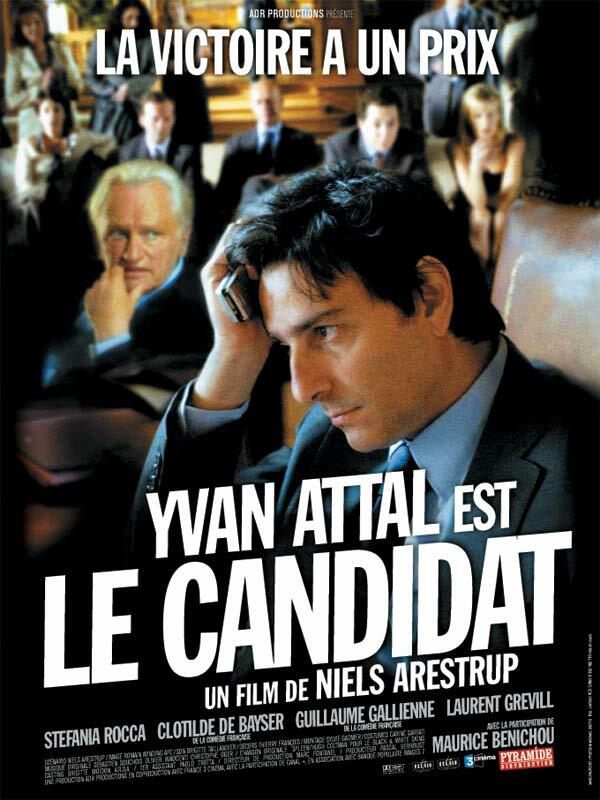 I had never heard of “The Candidate” before, but was familiar with the director Niels Arestrup who is also a screenwriter and director. He wrote the screenplay for this 2007 film and played Georges, a power broker in an unnamed French political party whose presidential candidate Michel Dedieu (Yvan Attal ) is like putty in his hands as the film begins. Georges has decided that the best thing for his party is to lose the election since France is about to intervene in some third world conflict and it would be better not to face the same kind of backlash that the Republican Party in the USA suffered after Dubya invaded Iraq. The original candidate had to drop out because he developed cancer (like much that happens in the film, that is only the official story) and Dedieu took his place. Considered wishy-washy, physically unimpressive, faltering in his grasp of facts and lacking charisma, Dedieu was chosen in the same way that the Washington Generals were chosen to play the Harlem Globetrotters. In the course of the campaign, Dedieu figures out that he is nothing but a patsy and decides to challenge Georges, his handlers and the entire political establishment. Instead of reciting bland platitudes, he will speak truth to power even if it means that he is finished as a politician. The film has a vague similarity to the 1972 film of the same name that starred Robert Redford as a candidate for the governor of California who also shuns “packaging” but only with the encouragement of party leaders who see him as unelectable against a popular incumbent. If he doesn’t have a chance, why not let him say what he wants? I may have seen 1972 film but it left no impression on me. If I live another 45 years, I am sure that I will remember every scene in Niels Arestrup’s film that is not only brilliantly written, directed and acted but is the most perceptive film about bourgeois political campaigns ever made. I can only encourage you to get hold of the mini-series Baron Noir, in which Arestrup plays a Socialist Party presidential candidate, and which over its eight episodes unfolds like a “best of” of french political life in the past twenty or so years. A very interesting mixture of cynicism and true idealism (the main character is rotten to the core, and yet is completely sincere in his devotion to – and ease when interacting with – the working class). Unlike in an american TV show, say Boss, where the parties would go unnamed by fear of losing half of their viewership, Baron Noir happens squarely within the realm of the PS… and as such, considering the outcome of the recent election, can already be qualified as historical fiction!